Melbourne, Australia – 23rd April 2017: Atomos once again redefines the workflow options for video creatives by creating the first production/studio monitor to combine a 19” HDR 1200nit 10+ stop panel with 4K 12bit Raw or 10bit 422 ProRes/DNxHR recording and HD recording up to 240p or live switching and recording of four 1080p60 channels. Adding HDR and 1200nit brightness to a 19” monitor at an MSRP of $2,495 is an amazing feat itself, but the addition of recording, switching and playback is a true revolution, completely redefining how production monitors will be used on set and in studio. It gives clients and crew on set instant access to review recorded content in HDR quality and doubles as a grading and editing monitor for laptops in the field. The live switching and recording is another dimension again adding the flexibility to live switch between four 1080/60p channels, record 4 x ISO channels and mix a live record complete with cueing, cross fade and hard cuts. “Seeing innovation come to life is the most exciting part of making technology products. Sumo is one of the most remarkable video products I have worked on.” said Jeromy Young CEO and co-founder of Atomos. “Versatile and highly advanced yet simple to use, it covers all kinds of high quality production from end to end at a fraction of traditional costs. The Atomos Sumo is truly revolutionary”. Sumo’s 19” 1920x1080 10-bit LCD panel is driven by the AtomHDR engine which precisely maps the Log/PQ/HLG from popular cameras, game consoles or TV makers to perfectly resolve 10+ stops of HDR in real time. The brightness range and vivid colors of HDR bring scenes to life either on the monitor itself, or when output to larger HDR/Rec709 displays for on set review. It can also be used with popular NLE or grading suites for affordable HDR or SDR editing or grading in the studio. Capture the RAW output from Sony FS5/FS7/FS700, Canon C300MKII/ C500 or Panasonic Varicam LT over SDI up to 12-bit 4Kp30 as CDNG or 10-bit Apple ProRes / Avid DNxHR up to 4Kp60 / 2Kp240 depending on the camera’s capability. The processing power of Sumo can preserve pristine quality direct from the sensor with data rates of up to 3.2 Gbps. Record direct to high capacity and widely available 2.5" SSD's that provide an affordable solution for long recording times. Switch and mix a live record and stream or record 4 x HD ISO recordings using the QuadLink SDI connections. Switch between feeds on screen with cueing, cross fade and hard cuts from the locked sources or tag and adjust final edits with advanced metadata tagging preserving ISO feeds, with the desired final result infinitely editable. Eliminate the need for a separate audio recorder by using the full size XLR connections to connect and power external microphones for balanced analogue audio with dedicated meters and adjustments for frame delay and gain. 48V phantom mics or line level audio are all seamlessly synchronized for the most advanced audio feature set in a monitor today. There is also a 3.5mm stereo headphone jack and built-in speakers for on set instant immersive review or complete internal recording review anytime anywhere with clients or production team. The extremely bright 1200nit display means you can accurately monitor, even when outside in daylight. Additionally, for the ultimate isolated viewing performance an optional hood is available. Like all high-end monitor’s, Sumo also has calibration to compensate for the natural color and brightness drift that monitors exhibit over time. Sumo’s calibration input lets you use X-Rite’s i1DisplayPro to always ensure accurate HDR and Rec709 monitoring. Seamlessly connect any SDI or HDMI device and convert between HDMI 2.0 & 3G QuadLink/6G/12G SDI in any combination. Quad SDI inputs connect cameras with multiple 1.5 or 3G SDI outputs without the need for converters. HDMI 2.0 supports up to 4Kp60 input/output along with the very latest Atomos open protocol that supports HDR automation including importing of camera settings. There is also support for Genlock and LTC timecode. The Aluminium alloy chassis with built-in armor houses ten mounting points around the bezel/top/bottom/side, a rear panel VESA mount and an included stand for a variety of mounting configurations. The optional mounting plates connect 2 x V-Lock / Anton Bauer batteries which in tandem with our patent pending continuous power system allows batteries to be hot swapped to ensure you’re never without power in the field. The Sumo delivers all of this connectivity while still maintaining a total weight of 6.2kg (13.7lb). 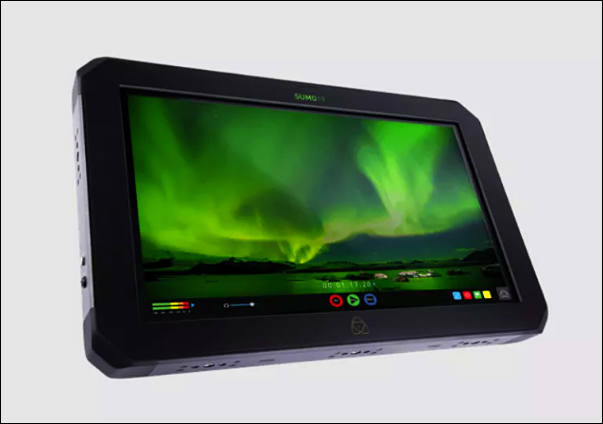 The 19” Atomos Sumo will launch in Q3 2017 for an MSRP US$2,495. Melbourne, Australia – 9 April 2018 – ProRes RAW is available today for Atomos recorders, delivering a powerful new RAW workflow when combined with Final Cut Pro 10.4.1. Simply install the free AtomOS 9 upgrade on the Atomos Shogun Inferno or Sumo19 monitor/recorders, connect to one of the nine supported cinema cameras, and begin recording in ProRes RAW and ProRes RAW HQ. Users can immediately enjoy the benefits of the amazing new RAW end-to-end workflow that combines the incredible performance of ProRes with the flexibility of RAW. Atomos devices are the only monitor recorders to offer ProRes RAW, with pristine recording direct from the sensor output of Panasonic, Sony and Canon cinema cameras. Come and see for yourself how Atomos is unlocking creativity at the NAB show, booth C9425 and at the 17th Annual Las Vegas SuperMeet on Tuesday 10th of April. There will be product demos, as well as the opportunity to get hands on with the gear and workflow with both companies. Melbourne, Australia – 01 June 2018 – At Cine Gear Expo Atomos are delighted to announce the release of a raft of new features for the Sumo19 HDR production monitor recorder. The release of AtomOS 9.1 for Sumo19 brings Quad ISO recording and onscreen selectable output switching, plus 5.7k ProRes RAW recording at up to 30fps with the Panasonic EVA1. In addition full display of 5.7k images on-screen, automatic HDR detection on playback and a redesigned user interface are on offer. The same 5.7k ProRes RAW recording option will also be available as a free update for the Shogun Inferno 7" HDR monitor recorder in the coming days.